Yesterday was our 17th wedding anniversary and I would rather cook a special meal than go out. I know I'm a freak, but that is what I enjoy, cooking. Last night was an easy meal, shrimp scampi, rib eye steaks, spring green salad and a rich chocolate dessert. Raven is busy at an acting workshop so we are having a busy weekend to beat. This scampi recipe may not be like ones you have had before but it is good! I am so glad you can buy deveined shrimp at Sam's! It saves a lot of time and trouble. We had this as an appetizer last night but we've had it over angel hair pasta and it is great also. Melt butter in a large skillet, add garlic and shrimp. 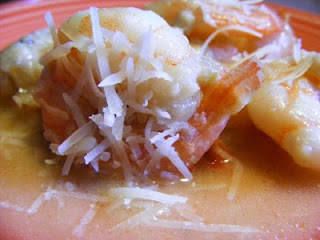 Cook over medium heat until shrimp turn pink, now add your cheese. This is so easy to make and so good! Make sure you make this bread to have along with it. The sauce, aka butter in this recipe is worth the calories!